A Testimonial from way across the pond! We look forward to serving the community here in Markham and Toronto with the same high level of professionalism. Why hasn't it worked for me before? A very good question and one which we have received on numerous occasions in Singapore and then now at our Laser center in Unionville, Markham. There are a plethora of underlying reasons for non-responsiveness to treatment, some ranging from the color and texture of hair, existing medical conditions or having had treatment done with equipment which is not powerful enough to cause the physiological change to the cell structure necessary to produce a result. With out having a chance to examine you and assess your condition it is very difficult to advise you, our prospective clients, as to reasons for your not responding to previous treatments. And it is in this respect, we invite you to make an appointment to come in to our centre for a free non obligatory consultation where we can have the opportunity to assess your existing condition and advise of you your suitability. If we find that we are not able to help you, we shall advise you at the time of your consultation thereby saving you both time and money. Lasers and "other" devices. Know the difference. Hairaway Canada uses the Light Sheer Diode and Lumenis One Laser systems in its centre in Unionville. We have found these systems to be the best available anywhere in the world for Permanent Hair Removal and we are delighted to make these advanced systems available to our clients in Markham and Toronto. Pigments in the hair and hair follicles absorb the light generated by these Lasers and this results in these structures becoming very hot. Intense Pulsed Light systems, which are commonly used and oft described as Lasers, are indeed not Lasers. The sun is out and the weather is absolutely glorious. Shorts, skirts, and T shirts are in. One thing to keep in mind though is to ensure that everyone who is considering permanent hair removal at our centre in Markham, MUST use / applies a high SPF sun block on all exposed anatomical areas. If you have a sun tan or any form of prolonged exposure to the sun, you will NOT be a suitable candidate for treatment. Have a great start to the summer folks. 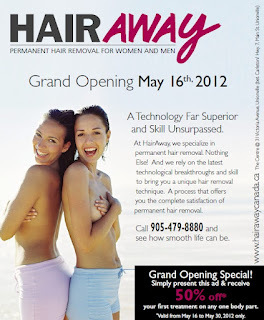 Hairaway Canada officially opened its doors to the public on 22nd May, 2012. Two clients well served and now looking to a bright future here in Markham and then Toronto. This is a copy of our advertisement appearing in the Markham Economist on 24th May, 2012. 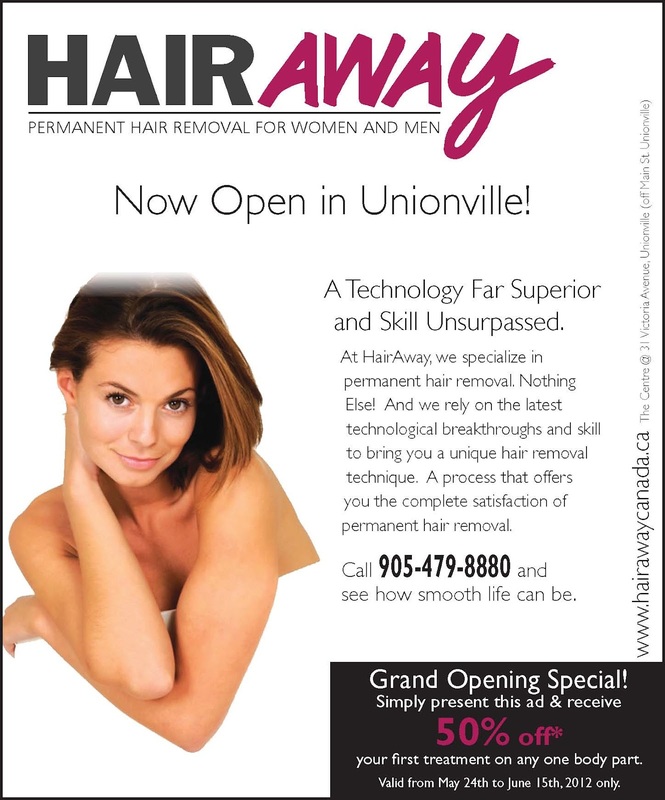 We look forward to welcoming you all to our Permanent Hair Removal Centre in Unionville, Markham.